The Army Creek watershed drains approximately 10 square miles in east-central New Castle County. The 4-mile-long mainstem flows east-northeast toward its outfall to the Delaware River just below the town of New Castle. The stream is free flowing, however, a tidegate is located at the mouth, which only allows discharge to the Delaware River during low tides, such that there is no tidal influence in the creek. 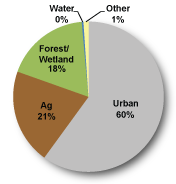 The land uses in the watershed are dominated by urban areas. This watershed contains two federal Superfund sites, the Army Creek landfill and the Delaware Sand and Gravel landfill. The city of New Castle, the only incorporated town, is situated in the northern portion of the watershed. There are nutrient and bacteria TMDLs for the Army Creek Watershed that require 40% reductions in nitrogen and phosphorus loads and 39% reductions in bacteria loads. There is one point source facility in the watershed but because of the outfall locations that do not discharge to Army Creek, there are only nonpoint sources of pollution in this watershed. The designated uses set for the Army Creek watershed include primary recreation, secondary recreation, fish, aquatic life, and wildlife, and agricultural water supply in the freshwater segments. The Army Creek Watershed has a total of twenty-nine sites listed in the Site Investigation and Restoration Section database. There are eleven sites that are state-fund lead (HSCA), six sites that are in the Voluntary Cleanup Program (VCP), six Brownfield program sites, three sites that have undergone a preliminary assessment / site inspection (PA/SI), two National Priorities List (NPL) sites and one site listed as a Formerly Used Defense Sites (FUDS). In water bodies of the Army Creek Watershed, samples have indicated that dieldrin and toxaphene, PCBs and dioxins/furans are present in the environment at levels requiring further attention under the Clean Water Act (1972). 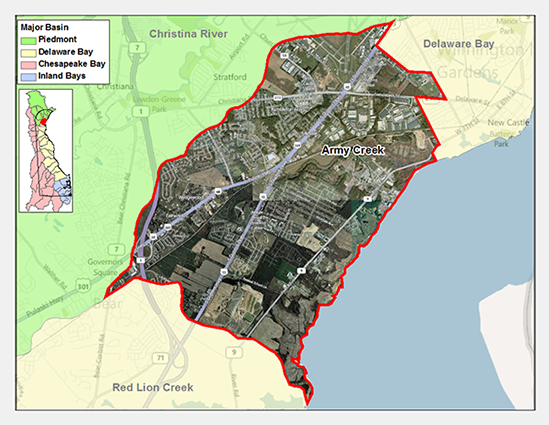 The Army Creek Watershed is on the 303d list of impaired waters as well as having State of Delaware Fish Consumption Advisories for PCBs, dioxin/furans, dieldrin and toxaphene. If you would like to view reports for any of the sites in the SIRS program please follow the link the DNREC Environmental Navigator to search by map for the Army Creek Watershed. The soils in the upper two-thirds of the watershed are classified as the Matapeake-Sassafras association, which has been described by the Natural Resource Conservation Service as, "well drained, medium textured and moderately course textured soils with subsoils that are moderately fine or medium textured." The soils in the lower one-third of the watershed are classified as tidal marsh. The soils are nearly level to the east grading to rolling with some steep slopes in the headwaters.